One of the best, brightest, kindest, and most selfless genealogists in the genealogy community, Laura Prescott, has decided to enter hospice care after years of fighting a tough battle with cancer. The Salt Lake Institute of Genealogy (SLIG) has announced a scholarship in her honor. As if the writing of this post, the fund has reached over $14,000! What a wonderful gift to remember and honor such a kind and generous person whose smile would just light up a room! Please consider a donation, no matter how small, to help honor this lovely person and gift the community with a wonderful legacy in her memory for years to come. The Salt Lake Institute of Genealogy (SLIG) held its first Tech Day this year prior to the regular week of classes. I presented a workshop on using Google’s MyMaps as a research tool. (I wrote about it here.) The SLIG program coordinators are seeking proposals and the Deadline has been extended to June 30, 2018. If you are a speaker, I highly recommend sending a proposal. You can read more about it and submit your proposals on their website. winner will be announced July 1st and their course of choice pre-reserved. expenses to attend one of the four US-based genealogical institutes. More 2017 Plans… and into 2018! So a few more things have been finalized that I can now mention publicly. 12 August 2017 – Ark-La-Tex, in Shreveport, LA holds an annual conference. This year I am their conference speaker! See this link for details. 7 October 2017 – San Antonio Genealogical and Historical Society, I will be the annual seminar speaker for this group as well. You can find out more information about the seminar here. The BIG NEWS that I want to share is that I will be a co-coordinator in a course at SLIG in 2018! I will be teaching a course with Kathryn Lake Hogan, with special appearances by Judy Russell and David Ouimette! The course will cover the Great Lakes region, more than a general survey, and intended to highlight the unique nature of history, records, documents, and methodology surrounding research in the Great Lakes region, both from the U.S. and Canadian sides. Watch for more details on this course coming soon! Reviving, Refreshing, Reviewing … And we’re back! This was NOT me in Salt Lake City. I am absolutely a huge fan of SLIG. It was my first time attending and I had an outstanding time. I think a large part of that was because of the friends I made and people I connected with beyond Facebook! I took the Advanced Practicum which is a different type of course. Everyday you get a new problem to work on, a case study that has been worked on and nearly completed by genealogists in the field, who then turn the problem over to the class with varying degrees of information to get us started. We then had 24 hours to work on the problem. We met everyday at 4pm to discuss our findings and get the next problem. I won’t go into the details of how it all worked, but the class was very interesting. I enjoyed seeing how others would go about solving the same problem, the different thought processes, and the sometimes different, sometimes same results. After SLIG I needed about a week to readjust to life. I had gotten out of all of my routines and I was exhausted! Living out of a suitcase gets old after a while, even though I love to travel. I did very much enjoy coming down from my hotel room to a nice continental breakfast and giant pots of coffee everyday. I didn’t have to worry about that part of my day everyday. It’s back to making my own coffee and bed again. And back to the blog. I have a fun plan for February’s theme so I’ll “see” you here soon! In my continuing quest to describe institutes and ultimately convince you to attend one if you haven’t already, this post will highlight the last two of the five major genealogy institutes that I have identified. I have not personally attended either NIGR or SLIG so the following information is a summary from what I’ve learned from reading their websites and from various friends and colleagues who have attended. I will be taking the “Advanced Evidence Analysis Practicum” track and I am very excited for the experience. The benefit of this conference, like British Institute, is that it takes place in Salt Lake. Classes take place in the morning and research or homework in the Family History Library. This coming year, the Association of Professional Genealogists’ Professional Management Conference (PMC) is being held a few days before SLIG. I plan to attend that as well. At the writing of this post, their website had not been updated to reflect this yet, but the information was sent to members via email. Keep checking their website for more information. The National Institute on Genealogical Research is held in Washington, D.C. annually in July (typically the week preceding GRIP). This institute stands out from the others in that it is very specific in scope. NIGR is not a beginning course and is aimed at a focused examination of federal records, there is only one track with everyone in the same course together. Most of the week is spent at the main branch of the National Archives with one day being spent at the Archives II in College Park, MD. There are optional evening sessions to spend at the Library of Congress and the DAR Library. This institute is different also by the registration format. This one is currently via regular postal mail only, no online registration at this time. You must go to their website and be added to their mailing list. Then, when registration time comes, you need to fill out the application and mail it back as soon as you get it. They have a limited number of spaces in the course so it is important to return the application promptly. This institute also has two scholarship opportunities that help pay for tuition and some of the travel expenses. One scholarship is from the American Society of Genealogists, the other is the Richard S. Lackey Memorial Scholarship. The details are on their website. That wraps up the details on the five major institutes. Up next, some tips on registering for institutes and later, what you might expect during your week. 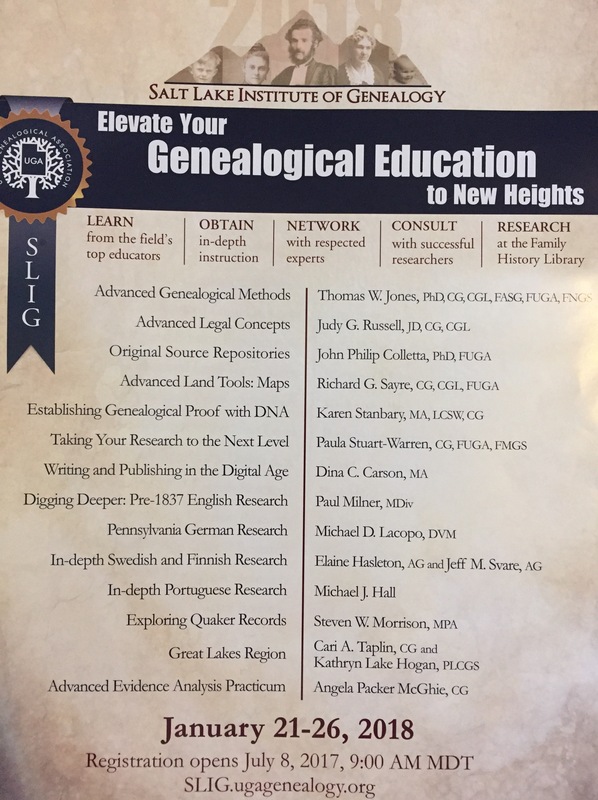 This summer I attended two outstanding genealogy institutes, IGHR and GRIP. I attended my first last summer and I am hooked. If I had unlimited resources, I’d attend them as much as possible! Genealogical institutes are great because you get to delve into one topic, in-depth for a full week. Also, being in the same class with the same people all week allows for networking and relationship building that one might not get at other educational events. Plus, there tends to be more time to ask questions from the instructors that might not be available at national conferences when they (or you) might need to rush off to another lecture. Over the next several posts, I am going to share some of the information I have collected to help those of you who have never been to one know what to expect, what to pack, things to consider ahead of time and other tips to enjoy these great opportunities for genealogical education. Before you go there are few things you’ll want to consider. First of all, you will want to consider your travel arrangements. Depending on where the institute you will be attending is located, you may want to fly. However, taking a car, train or bus are also viable alternatives. You will want to decide if you will stay in the dorms, a hotel or on a friend’s couch (or guest room). Will you want to take advantage of the cafeteria meal plan, eat out or pack your lunch. Also, when you are there, depending on where you stay you will want to determine if you will need daily transportation to and from the venue. I usually have to locate the nearest coffee shop when I travel. And don’t forget to plan some extra time for sight-seeing. Why go all that way if you can’t see some of the local attractions while you are there? highlighters, pens, pencils, notebook, sticky notes, etc. While I’m sure there are other things to bring. If you have been to an institute and would recommend something else, please feel free to add it to the comments below. Over the next several posts I will be looking at the 5 major institutes and give some of the unique details about each.